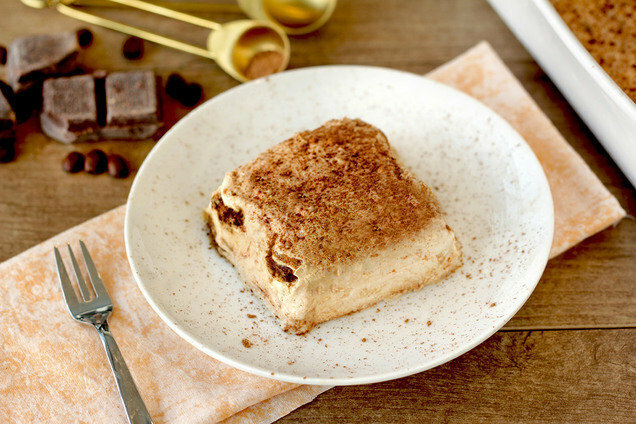 Tiramisu might seem too decadent to fit into a healthy diet -- there's the sugar, the creamy cheese, those ladyfingers -- but that's not the case! Check out our lightened-up spin on the classic Italian dessert... Perfect for your next get-together of family and/or friends! In a glass, combine coffee granules, 2 sweetener packets, and rum extract. Add 1/4 cup hot water, and stir to dissolve. Add 1/2 cup cold water. Transfer 1/3rd of the mixture (about 1/4 cup) to a medium-large bowl. Add ricotta, cream cheese, vanilla extract, and remaining 2 sweetener packets. Stir until smooth and evenly mixed. Fold in whipped topping. Place 8 ladyfingers evenly in an 8" X 8" baking dish. Drizzle with half of the remaining coffee mixture (about 1/4 cup). Evenly spread with half of the ricotta mixture (about 1 1/2 cups); sprinkle with 1/2 tsp. cocoa powder. Evenly layer with remaining ingredients: ladyfingers, coffee mixture, ricotta mixture, and 1/2 tsp. cocoa powder. 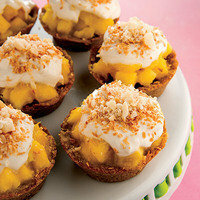 Hungry for More Healthy Multi-Serving Desserts? Check out our latest bestseller, OBSESSED!, for even more decadent desserts. We're talking 97-calorie Bam Bam BrownieZ, gluten-free Tropical Pineapple Cutie Pies, five-ingredient Fluffy PB Mousse, and MANY more. Click to shop (mega savings)! Start planning your next dinner party... Click "Send to a Friend" to share this recipe now!